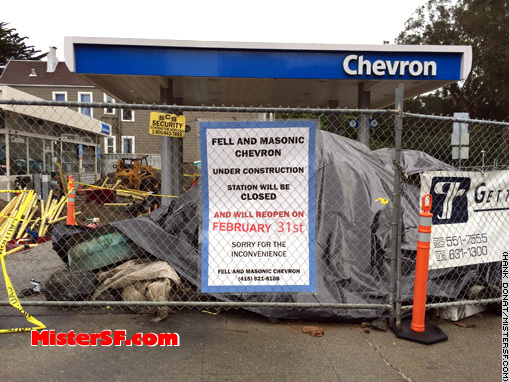 Dateline: 1698 Fell Street, where Panhandle neighbors were surprised to learn that renovations to the Chevron gas station will not only take longer than expected, they will actually add two days to the month of February. According to a sign posted on the property, the gas station will reopen on February 31. When alerted to the that fact the month is only 28 days long, crew members at the site acknowledged the gaffe and said they expect to reopen “around March first.” Mister SF reached out to Chevron’s corporate office for comment. We expect a reply some time after the 12th of never. With a candy parade of sorts, Mister SF ensconces the drinking holiday Bay to Breakers in his gallery of San Francisco institutions. 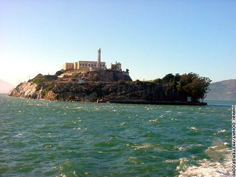 Mister SF visits the Panhandle to say so long to an iconic neighborhood resident. Panhandle neighborhood says goodbye to the Pink Lotus. Still no sign of Jerry Tang.